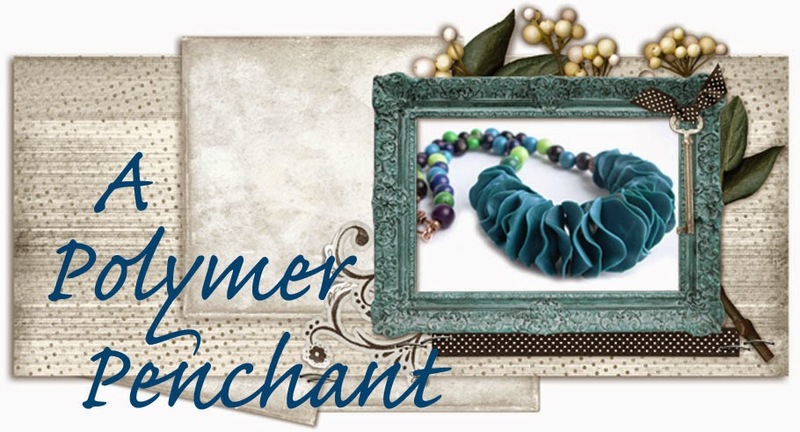 A Polymer Penchant: Bead Soup Blog Party 7 Reveal! Welcome, welcome! The party is already in full swing with the first reveal group, the second group today and next weekend will bring a third and final installment this time. This is the brainchild of Lori Anderson of Pretty Things, I’m sure you are all familiar with this wonderful concept, for full details check out What is the Bead Soup Blog Party? With over 500 participants you would be hard pressed not to find some inspiration in all these collaborations. With that great volume in mind lets get going! My first piece to come to fruition used the little purple (sometimes amber) glass bird. She has the most charming little face I wanted to be able to see her so I turned her into a ring. I wanted it to appear as if she had just landed for a sip of water from a little puddle. Next, thinking of my little bird, I decided she had escaped from a cage using, what else, but that gorgeous key that Cindy elevated from utility to art. The cage is made from a sewing bobbin base with a wire frame that I fiddled with forever before getting it to sit just how I wanted. The key can spin and it turns the empty roost inside the cage. To say I struggled trying to photograph this piece is an understatement. The colour scheme came together from the key and two of the melon beads that had more of the blue/purple flash. I created a translucent pearly pale green to complement the key and used Swellegant for the first time in creating the polymer keyhole/key shaped pieces. The five polymer discs have a touch of iridescent violet powder to let them shimmer and are woven with irish waxed linen sit across the back of the neck. Here it is on. Notice the little bird in the bottom right picture. The bigger of the two is shrink plastic before shrinking and, you guessed it, the little one sitting on the polymer disc has been shrunk. I was snapping away taking pictures before I noticed I had forgot to add them. The plan was to glue them since curing them on the polymer sounded a little risky for that long in the heat. Now I’m not so sure, maybe just one? maybe none? I had another bead that could have easily been the focal also. The swirls of glass inspired me to try my hand at a Cellini spiral for the very first time. I had it in my head I wanted to use a tonal bead mix. Thank goodness I opted to use the mix as the biggest bead in the spiral, otherwise I would have never kept the pattern straight. But it wasn’t all rookie luck, in my attempt to include a lot of colour I ended up with a massive diameter so a long length was out of the question. A hop, skip and a jump and I ended up making a hair stick (uh, not using the same glass focal but another slimmer bead). Ok so back to that focal and another try at a Cellini spiral I brought in the silk Cindy dyed and created some twisted polymer elements to keep the spirals going. You can see the original creation at the top right below. I liked the idea in theory but not so much in execution. I separated the elements and liked it so much better. My second Cellini spiral I sort of made up the ends of the tube to try and get a more round shape and the mykonos copper discs Cindy sent totally finish off the very simple version with it on a cable choker (below bottom right). The tea dyed silk is awaiting new inspiration. Still with me? I’ve been bringing you along for the journey as the pieces came together. I was really trying to use every last bead and at this moment there are four other projects on my worktable. I’m going to take a bit more time with them, perhaps wrap them up in time for the third reveal. But I needed to turn my attention to the handcrafted, stamped clasp Cindy sent. I envisioned swooping banner type polymer elements to echo the shape and planned them to be a translucent blue with the glass melon beads at the “gather” points. I ended up a little off course and with somewhat of a circus feel. This necklace became the exploration of a few polymer head pins, a polymer bail, some wire embedded polymer swags, and some thin sequin-esque polymer to make a chain section. In other words, a whole lot of fun all inspired by the two glass melon beads and clasp and capped off by a Jade Scott pendant that arrived in the mail at just the right moment. With it and the clasp oxidized it may look like the rest of the copper I added should be too. I'm torn though since there is copper leaf in the polymer, nice and bright copper. So for the moment this copper isn't sealed whilst I decide. Feel free to let me know what you think! I just realized I have two pairs of earring I forgot to photograph so I will have those to share another day. Thank you so very much for visiting and reading this far! I swear I really did try to not chat so much. I can’t thank Lori and Cindy enough for this gift of beautiful beads and moreover beautiful inspiration! Now, it’s time to go see what the rest of the second reveal crew brought together. Please hop on over to Lori’s second reveal post – special treat is the map that shows how one woman can conquer the world! I'm stunned 8-o I love the key-necklace but my favourite is the ring! I love the bird cage necklace. You had some really interesting pieces in your soup, and created jewelry that showcase them perfectly. Fabulous pieces, the ring and the birdcage necklace is stunning! WOW! Emma you really have a way with words! Your writings are as creative as the pieces that you have designed. I am so honored to be a part of the final product! Beautiful pieces and wonderful imagination. Love the bird in the cocoon! Boah, Emma - what a great soup cooking! Couldn't find a word for all those great pieces: just stunning. And I couldn't decide which one I love the most, the birdie ring and the cage necklace are surely on top of my wishing-list :0) You're an outstanding artist, my dear! Wow - These are awesome, Emma! So impressive! Oh my, the birdcage necklace is amazing! I love it! Wow, amazing designs. The ring is so unusual and the birdcage you made is so inventive. Lovely pieces! The birdcage is so cool! I love the polymer additions you have made to the various pieces. They have definitely enhanced these pieces. I am in awed of your talents (writing and creating). Beautiful rendition of the beads given. The circusy tribal giraffe necklace is awesome . (Now there is a sentence I never thought I'd write.) I love your cage and the polymer key links! I'm not sure you need the black birds, but I'll leave it with you to decide since you obviously know what you're doing. Such unique and individual designs~ love your thoughtful attention to each piece. Beautiful work! great necklace with a super cage!!!awesome! Nice bead soup, love the giraffe! The ring and bird cage necklace are STUNNING!! come check out my 1st and 2nd reveal favs tomorrow. I was blown away by your lottle bird ring, absolute genius! I really loke the circus necklace too, I have a thing for giraffes. I would have never thought to use a silk coccoon in such a way. You are so imaginative and talented ! Love the key and birdcage necklace, too ! I love that you took up the challenge of the hop and tried out some new things. Gorgeous colors in your Cellini spiral. If I had to choose a favorite, it would be your last piece - that would be so much fun to wear! I love the use of the polymer clay mixed with metal very creative. I love the first necklace design. very beautiful. The bird cage necklace is my favorite! Great job on all your pieces! Very creative! WOW!! You are FANTASTIC! I LOVE the ring... Great work! As usual you are amazing. The way you incorporate pieces is so eye catching and fun! I love all your pieces, all great designs! Oh my gosh - all of your pieces are phenomenal. I love, love, love the bird ring and the key/bird cage necklace - FanDamnTastic! Seriously all of your pieces are gorgeous! Beautiful! Love the hairstick the most♥ of it all! Wonderful, unique pieces!! Love them all but my fav is the bird ring. Fantastic bead soup!! Beautiful work. That ring is amazing! and, the birdcage! Love it all. Great job! Wow! I absolutely love the bird themes you went with. The ring is my favorite. Great job! Such a clever artist you are! Love them all. Thanks for visiting my blog as well. Nice job with your soup! I love all the elements and how you put it all together...sweet cage! The birdcage necklace is so unique and awesome! Love all your creations! What a lot of thought you have put into your soup, the little bird ring is so inspired! The necklace with cage is very artisitc and I love the hair stick everything is great well done! How clever. The bird story is so lovely. And of course the pieces, all of them, are awesome. LAWDY! You made some really inspirational and simply gorgeous pieces. I'm particularly smitten with your bird ring and cage/key necklace. They're both phenomenal. Of course, the rest of your pieces are beautiful also. You've got me itching to see those earrings. I can't wait!! I must say that everything is so very creative!!! Loving that key necklace! What incredible pieces, Emma!! I especially love the cage necklace - so many beautiful components and it looks so pretty worn. OMG, Emma - this is quite amazing! So many beautiful pieces, so much creativity! I love the idea of that ring; the cage necklace is gorgeous; I thoroughly enjoyed the story of the pin (quite a happy accident you got yourself there) - and your polymer creations in all the pieces are exquisite. Wow, I love everything! The cage necklace is just to die for. (Plus, I'm a sucker for lampworked keys! LOL!). The birdcage necklace is very creative! Those are really gorgeous and I love your ideas - especially the hairstick. Wow! It's all so beautiful! Wow-the pieces you designed are fantastic! I honestly cannot pick a favorite! Love the variety of artistic elements in each design. You really rocked this soup Emma! Thank you for stopping by my blog and leaving a comment! I am still going down the list and visiting the blogs. So many lovelies. Yours are gorgeous!! I love the bird cage necklace and the ring!! Nice job on your bead soup! I love your work, kudos on the cellini, you did a great job! I love the ring, is that really a cacoon? Wow oh wow! I love the little bird in the water. You have such a great imagination! Thank you for stopping by my blog, and a big thanks for the nice words. Finally making my way through the second reveal. I really love how your last necklace came out, it looks so fun and different the way you pulled it all together. Emma your pieces are very creative and unique. Wonderful job using your soup. What an intriguing mix of techniques you used with your soup, and what a lovely banquet you cooked up! The bird ring is just so cool -- I imagine it's a real joy to wear and a sure-fire conversation starter. I loved reading about how you came to your designs. It really made it feel as though I was in the studio with you. I am totally in awe of your first necklace. It took a lot of work with the bird cage but I bet that it is a lot of fun to wear. You are incredibly creative and resourceful! I love the key/birdcage necklace. So pretty and creative! Fabulous! I am in love with EVERYTHING you made and would wear any and all of them (particularly that first necklace!!!!) Thank you so much for participating so wholeheartedly! focus of life–week 14–Up close!